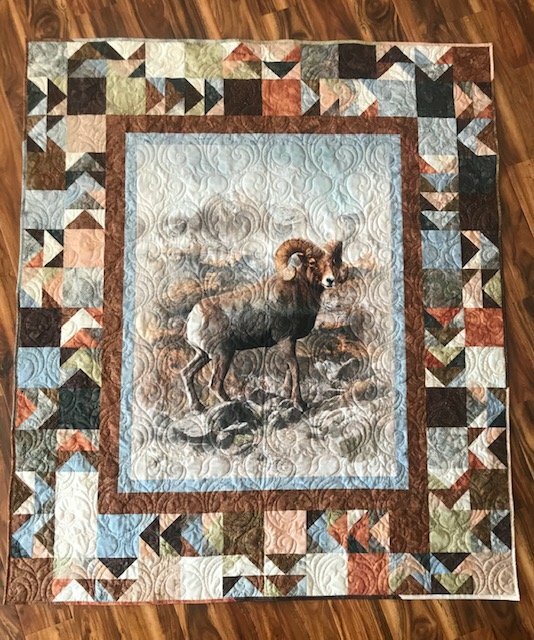 Q4536-20-Natural Call of the Wild Hoffman Fabrics, this cotton print panel features a highly detailed, larger than life, Big Horn Sheep posing on a rock outcropping with a beautiful mountain scene in the background. Panel size 34 x 43 inches. Call Of The Wild by Hoffman Fabrics. Step into the wild with panels full of impressive nature scenes. Digitally printed to capture the true beauty of the outdoors. Hoffman Fabrics, this cotton print panel features a highly detailed, larger than life, Big Horn Sheep posing on a rock outcropping with a beautiful mountain/ scene in the background.